The Center for Information Technology and Development (CITAD) has since last year been holding a monthly inspiring and mentorship lecture for it’s staff, interns, volunteers, associates, civil society advocates and young people from various tertiary institutions in Kano metropolis, the monthly interactive lecture titled “Inspiring Leadership Reflection Series (ILERIS)” usually hosts guests speakers from different backgrounds and professions who have an exciting life profile that may inspire youths to also succeed in their various endeavors. This month, the center features Dr. Musa Abdu Auyo, the librarian of Bayero University Kano as the guest speaker. In his opening remarks, the Executive Director of CITAD Yunusa Zakari Ya’u said “we normally invite our guests on the basis of their struggles and success so that our participants can learn from their life experience, what they have gone through, what they encounter, how they solve these problems, the successes they recorded and so forth, so it’s learning by experience, by getting people to tell their history, you get to have a feeling that all successful people are ordinary people, they are ordinary people who have gone through a series of developments from grass root up to where they are”, YZ advised the participants to listen carefully and learn from the guest speaker in order to discover their dreams and work towards those dreams. Taking the participants into his profile, Dr. Musa Auyo toured them into his academic background which began in the 1980s, unionism and activism for societal development and welfare and community service initiatives. Having served in forty different committees either as Chairman or Secretary, Dr. Auyo clearly noted that setting concrete principles and adhering to the principles is not only making one organized but sets standard and guidelines towards one’s better conduct. Life is full of sweet and bitter experiences and they need to be managed prudently so that they are turned into benefits, Auyo observed. He responded to many questions and comments raised by the participants after his presentation. 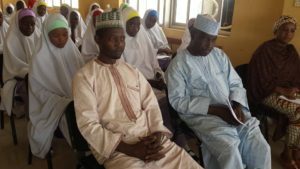 The event ended with a closing a remark by CITAD’s training coordinator Malam Ahmad Abdullahi Yakasai who thanked the guest speaker for finding time to attend the lecture despite his tight schedules and advised the participants to utilize what they learned from the guest’s rich profile. The Center for Information Technology and Development presented some publications of the organization to the guest which Senior Programmes Officer Kabiru Saidu Dakata presented.